BeyondName...: The End of Evil..
After Raktabeeja was slain and the army of demons were killed in battle, Shumbha and Nishumbha gave way to unbound wrath. Very soon Shumbha – Nishumbha set forth with their troops to slay Chandika. The Gods now witnessed a severe combat between the Demons on one side & the Devi on the other. The Devi first took on Nishumbha, who attacked her with a spear. Hurling a dart at him, she pierced his heart. As soon as his heart was pierced, another demon emerged from his chest, with equal strength & valour, who tried to stop the Devi from another brutal attack. Ignoring his plea, she severed his head off with her sword. And soon he fell lifeless on the ground. All this while, the Devi’s lion devoured the demons whose necks he had crushed with his fierce teeth, and Kali and Shivaduti devoured all others who lay dead in the battle field. When Shumbha saw his dearer than life brother dead & his army perishing, he was furious. He blamed the Devi for being conceited & wicked. 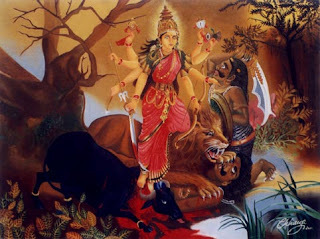 He believed that the Devi was dependant on the strength of other Shaktis for strength & yet thought highly of herself. Less realising that the Shaktis were all a manifestation of the Devi herself in all her glorious forms. Challenged by the Devi and furious with rage with the death of his brother, Shumbha sets forth to fight the Devi while the Gods & Demons stand witness to the horrific sight. There in the sky Shumbha and the Devi engage in the fiercest of battle with showers of arrows, sharp weapons and frightful missiles that frightened the three worlds. After carrying on a close fight for a very long time with him, the Goddess flung him down to the earth piercing him on the chest with a spear. As the demon fell lifeless on the ground, he shook the entire earth with its oceans, islands and mountains with his massive form. The death of Shumbha – Nishumbh brought a new dawn in the universe. The world regained its original state of perfect peace. The potent clouds vanished, the sun shone brighter and the sky became clear. The rivers took the original course & everything was renewed. The Gods rejoiced & Gandharvas sang hymns in praise of the Goddess while the Apsaras danced! Shumbha is none other than sense of ‘I’ or ‘Me’, the pseudo-self that identifies the self with non-self, whereas Nisumbha represents the sense of ‘Mine’, or the attachment to things that the false self clings to through identification with other objects. Shumbha – Nishumbha follow each other closely. Where there is this sense of ‘I’, automatically there will be a sense of ‘mine’ as an extension of the false sense of selfhood. Shumbha also means doubting oneself and Nishumbha means doubting others. When the mind is clogged with doubt about oneself or others, neither peace nor progress is possible. That is why they are the kings of the demons, the highest in the order of negative influences. Negative forces come up only due to lack of energy, Shakti. When you are full of energy and enthusiasm none of these asuras (demons) can harm you. The battle between the demons and the Goddess is compared to a Maha Yagna because it represents the greatest purification process.